SYNLawn of Northeast Ohio can help anyone from Akron to North Canton looking for innovative solutions for cleaner pet areas, custom putting greens, safe play areas, and lawns with the most advanced artificial turf products in the industry. This synthetic grass company carries approximately 25 different synthetic grasses that apply to every application and livability issue. They will design and build the indoor or outdoor putting green of anyone’s dreams for year-round golf practice, and fellow competitive golfers will wonder what the secret is to their golf partner’s success. They will be able to contribute the drastic improvement in their short game to the indoor putting turf that they had installed by SYNLawn of Northeast Ohio. Golfers who want to practice at home in the evenings after work on a sunny day can take advantage of the outdoor putting turf that can be installed as a backyard putting green. 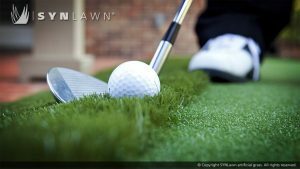 Calling SYNLawn of Northeast Ohio will make every avid golfer happy every day when they gaze upon their very own professional green right outside their kitchen window. SYNLawn of Northeast Ohio is highly involved in the Cleveland Golf Show taking place February 16-18, 2018, and will be the main sponsor of the long putt challenge. Contestants will need perfect line, speed, and luck to conquer the 70-foot long sidewinder. As one of the most exciting competitions, a tournament-like cheer can be heard throughout the crowd when a hole is sunk. The more holes a contestant makes, the more they win…one putt wins $5, two putts wins $50, and three putts $100! SYNLawn of Northeast Ohio is offering show discounts — including a $500 discount on a 15’x30’ or larger custom putting green. Anyone can stop at the SYNLawn booth right around the corner from the long putt challenge to pick up the coupon and sign up to receive free samples of the material. They are at booths #538-540 and would love the chance to talk to passionate golfers! From Akron, Ohio, to Cleveland, Ohio, winter will never be any amateur or professional golfer’s favorite season, but they will survive much better with the indoor putting turf that SYNLawn of Northeast Ohio can install with their custom putting greens. A visit to the Cleveland Golf Show in February will also help alleviate the pain of looking outside and seeing the snow that is covering their outdoor putting turf in North Canton, Ohio. 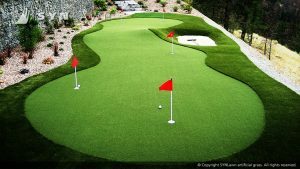 Anyone considering the fact that they could be practicing their short game every day with artificial turf products installed as a backyard putting green can call this synthetic grass company for all the discounts and golfing needs they will ever have! This entry was posted in Golfing, Home Improvement, Recreation/Sports, Synthetic Grass and tagged artificial turf products North Canton Akron Cleveland Northeast Ohio, backyard putting green North Canton Akron Cleveland Northeast Ohio, Cleveland Golf Show North Canton Akron Cleveland Northeast Ohio, custom putting greens North Canton Akron Cleveland Northeast Ohio, indoor putting turf North Canton Akron Cleveland Northeast Ohio, outdoor putting turf North Canton Akron Cleveland Northeast Ohio, SYNLawn of Northeast Ohio, synthetic grass company North Canton Akron Cleveland Northeast Ohio by admin. Bookmark the permalink.